There are more than 20 miles of trails at Babcock State Park, with several different options for loops and linkups in the park. 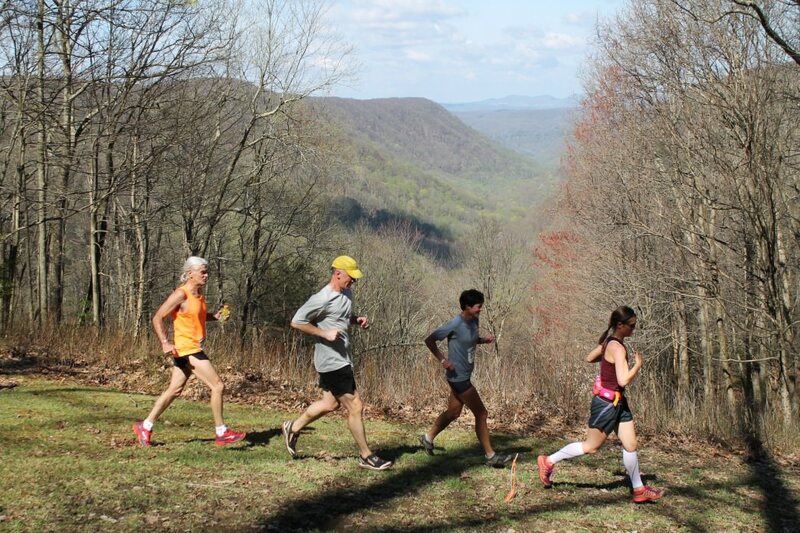 You can trail run here all year long, but wear spikes in the winter. Fall and spring are absolutely beautiful, and during the summer it's best to run early or late to avoid the humidity. Located in the outdoor wonderland of Fayette County in West Virginia, Babcock State Park is definitely a must-see destination. This Civilian Conservation Corps-Era park is most famous for its often-photographed historic grist mill, which is right above the falls of Glade Creek. But even deeper in the forest is where trail runners will find their little piece of heaven. There are more than 20 miles of trails to explore in Babcock State Park. Trailside mountain creeks, rustic wooden bridge crossings, fern covered boulders, old growth trees, and rhododendron tunnels are all par for the course while running through this beautiful forest. There’s not much to dislike about Babcock State Park, and it might just be that quiet spot you’re looking for in a county filled with bustling outdoor destinations. Since a lot of the outdoor recreation traffic heads toward other locations, Babcock is a break from the crowds. It’s also important to note that the park is nearly 1,000 feet higher than other areas, making temperatures more pleasurable for most of the year. Once you drive through the park’s gate, you will sense that you are truly somewhere special. Old rock walls line the main road to the gristmill and visitor center where you will start your run. As you stretch out and double check your laces in the parking lot, you’ll hear the roar of Glade Creek Falls, and be surrounded by beautifully green rhododendron, mountain laurel, hemlock, and douglas fir trees. A classic 6.5-mile loop starts at Old Sewell Road, the paved walking trail behind the grist mill. Follow this down along the creek and keep an eye out for the log cabins on the right (they are excellent places to spend the night). Continue down the trail past the gate as it turns to dirt. As the trail takes its first switchback, be ready to take an old wooden bridge across the rock-strewn creek, and start a gradual climb through rocky terrain. This is Narrow Gauge trail, a reclaimed old railroad track that nature has so elegantly taken back. Continue down the trail past boulders on your right and through tight rhododendron tunnels until you reach a paved park road. This is Park Forest Rt. 802. 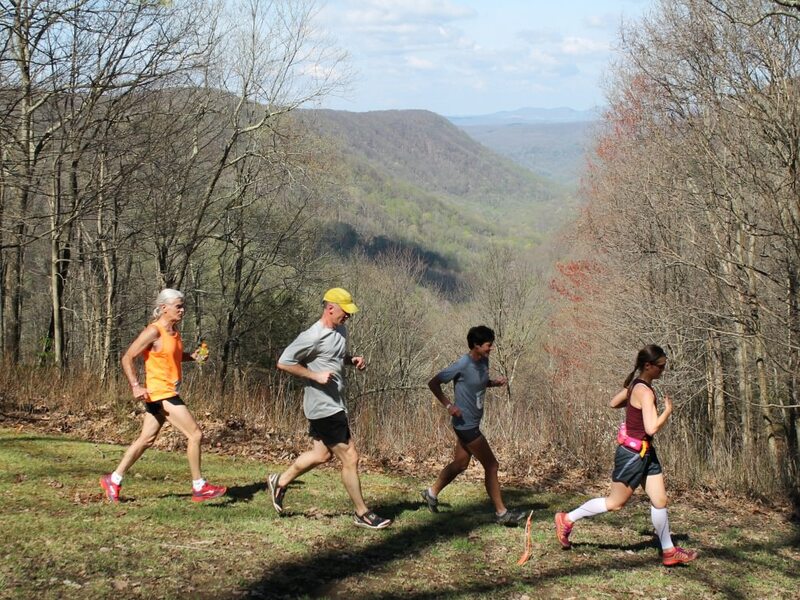 Get ready for a lung-buster as you climb a steep grade for 1/3 of a mile. At the top of the hill, stay to the left and follow the road back to the grist mill. If you are looking for something a bit shorter, the Narrow Gauge Trail is 3 miles on it’s own, or you can check out the 1-mile Lake View Trail. Trail runners hoping to get away from the whitewater and climbing crowds will find the serene but rugged forest trail system of Babcock State Park is the perfect place to get lost in thought while exploring beautiful trails. Also, if you’re looking to get an edge on the competition for the prestigious Gristmill Grinder Half Marathon or Sticks and Stones 15K races, you can train on the course to work on improving your race results. Get to Babcock State Park by WV Route 60 (Midland Trail). Nearby towns include Fayetteville, Rainelle, Summersville, and Beckley, WV. There are no fees for the park. The most centrally located parking spot is the parking lot next to the grist mill and visitor center. Walk across the bridge and around the grist mill to Old Sewell Road, which is the trailhead for the loop mentioned above. For a complete list of the trailheads, check out this map before you go.